Cast: Jack Palance, Eddie Albert, Lee Marvin, Robert Strauss, Richard Jaeckel, Buddy Ebsen. A mileage sign – Spa, Malmedy, Limbourg – suggests we are somewhere in the Ardennes during the Allied drive into Nazi Germany. But as the drama of a young lieutenant let down by his captain gets underway, historical accuracy gives way to thematics with a respected place in 1950s Hollywood output and in director Robert Aldrich’s canon. 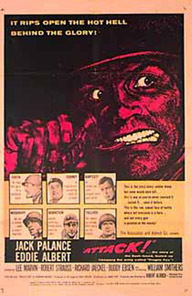 “Attack” is a male melodrama focussing on the tensions of rank and class among men at war. 1950s Hollywood cinema is characterised by films that chart the postwar male attempt to reconcile the role of victor in the most savage and decisive conflict in history with that of domesticated breadwinner in the most successful economy in history. A number of films play out this dilemma through examinations of fraught father/son relationships. In Rebel without a Cause (Nicholas Ray, 1955), the son lashes out at a father who has failed as a role model. In The Seven Year Itch (Billy Wilder, 1955), the role model is too ‘strong’, recommending a transgressive ‘hootenanny’ while the executive’s wife is away for the summer. In Written on the Wind (Douglas Sirk, 1956), Father is pleased to see his son settle down in marriage and inherit the family oil derricks. But the son is impotent and becomes an alcoholic. In “Attack“, Captain Cooney (Eddie Albert) is the son of an abusive Kentucky judge. Within the army hierarchy, he is symbolically the son of fellow Kentuckian, Colonel Bartlett (Lee Marvin) who has promised him a citation. But Cooney is a coward and his men die because of it, so he becomes an alcoholic. In a cosy arrangement, Cooney requisitions bourbon and cigars for Bartlett while Bartlett secures the citation, in anticipation of political favours from Judge Cooney back home. Plying ‘Clyde’ with drinks and smokes, Cooney descends from a tradition of conflicted postwar sons trying to please patriarchs who despise them. When the officers play poker, Bartlett invariably wins. Dominating the scene, his conversation strives to shore up a status quo from which only Bartlett benefits. (Later, he strides towards the camera, Marvin’s bulk literally blocking out the image). Aldrich is quoted as having said, “A director is a ringmaster, a psychiatrist and a referee” (1), evident in the film’s mise en scène. One shot of the poker scene is an overhead of a circular table around which the men sit, each divided by rank and class from the next, metaphorical fathers and sons in a conflict more far-reaching than that of the war raging outside. Echoed in Costa (Jack Palance) and Cooney’s sniping are fissures that rend the postwar American living room. “Attack” takes place in a medieval town cluttered by balustrades, bottles, baroque scrollwork, telegraph wires criss-crossing a devastated street. Notice how the camera frames men in doorways, windows, holes in the brickwork. In the depths of his wretchedness, Cooney is tightly framed against a windowpane. Clinging to a slipper, that arch symbol of domesticity, Cooney’s longing for the comforts of home mark him as subversive. For critic Manny Farber, “The Aldrich films are filled with exciting characterizations – by Lee Marvin, Rod Steiger, Jack Palance – of highly psyched-up, marred, and bothered men.” (2) As Costa’s limbs are crushed by an advancing panzer, he bellows like a trapped animal. His arm smashed and bloody, he asks God for one more minute to kill Cooney, invoking the heavenly Father in a world in which no effective earthly father can be found. Respected by his fellow soldiers, but betrayed yet again by Cooney, the soiled and tired, brave and angry Joe Costa is the eternal American ‘grunt’. When we first see him, he is making horseshoes, Palance’s rugged frame resembling an American Stakhanovite. (3) The sense in which “Attack” charts less chronological history than contemporary fracture can be felt as Costa returns, apparently from the dead, to confront Cooney, the clamour of war faded as the film seems to stop so as to attend to its most pressing business. As Costa’s fellow soldiers Bernstein (Robert Strauss) and Woodruff (Richard Jaeckel) pump lead into Cooney’s body, leaderless men impotently rage against the privileges which divide and cripple them. The final image of Joe Costa finds him lying on a stretcher, his mouth agape. The dialogue between action and inaction in “Attack” is a lament for a rugged individualism that is central to the United States’ view of itself in the last century. The implication that business is not ‘proper man’s work’ is borne out in Cooney, a businessman back home who daily fusses over Army protocol whilst Costa’s men fall before the German machine guns outside. Appearing on that mileage sign is Malmedy, a town made infamous by the SS executions of American POWs in 1944, a fact not lost on American audiences in the immediate postwar period. In a Hollywood war movie in which the Americans are plainly losing, Colonel Bartlett tells the exhausted Woodruff that “A couple of weeks in Paris you’ll come back a new man”, as if manhood can only legitimately be found on R&R. True to the rampant phallicism of 1950s melodrama, tank barrels nose through the streets and cannon fire spurts out of machine guns. Aldrich put his title in quotes not simply for irony. It was a gesture. Palance earned his gaunt, taut-skinned appearance from severe burning and plastic surgery as a WWII bomber pilot.